Climbing Mt. 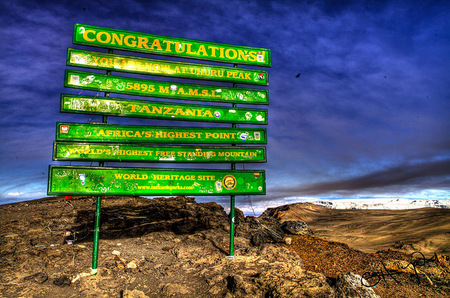 Kilimanjaro is likely something you’ll only do once in your lifetime…unless trekking is a passion of yours. Although I am going on the safari part of our inaugural Tanzania tour, bum knees keep me from doing any climbing or trekking. However, in an effort to help you be as prepared as possible, I’ve gathered some tidbits of information about the climb. Climbing Kili isn’t just for the ultra-fit—although being fit and healthy is an important factor, it’s far more important to acclimatize during the ascent. Don’t burn yourself out at the beginning when the going is easier. Aside from the summit day, which is a very long day, you’ll be trekking five to seven hours each day. Build up your stamina by doing practice hikes at home, or work on your cardiovascular at the gym. There are many routes up Kili, but we’ve chosen the one that’s considered the easiest as it allows everyone to acclimatize as much as possible. Avoid altitude sickness—some people may be more prone to altitude sickness than others, but it is possible to minimize the effects by following a few simple rules. Don’t exert yourself, and go slowly at all times. This may be hard to remember in the lower reaches of the trek, but it’s important to pace yourself. Drink plenty of fluids as dehydration is a contributing factor to altitude sickness. It’s recommended that you drink three liters of fluids a day. Climb high and sleep low. The third day of the trek will be an acclimatization day. 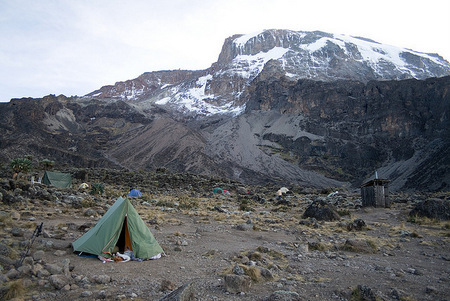 You’ll climb in the morning and then descend for a couple of hours, reaching the camp where you’ll spend the night. This descent is important in helping your body acclimate. You don’t have to be a climber—you won’t actually be doing any technical climbing. You’ll just be going on a very long hike! Packing for the trek—you’ll be hiking through four different climatic zones, so it’s important to dress in layers. You’ll likely want a thermal layer, a fleece and a wind-breaking jacket. You’ll also need gloves and comfortable hiking boots. Trekking poles will help lessen the pressure on your knees, particularly when you descend. As the departure date approaches, we’ll offer a complete list of packing requirements. Food—eating well is of prime importance. Food will be carried by the porters but you may want to bring snack foods, such as energy bars with you. Plan on eating three snacks a day. It’s important to eat even if the altitude is causing you to feel nauseous. Probably the most important factor in making it to the top is determination!